What is EDDM Full Services? What is the difference between EDDM Print Only and EDDM Full Service? With the EDDM Print Only option, all the sizes and options you see are approved for EDDM processing. We print and ship to you just like a normal postcard. Be aware that you still have to design and place an indicia and addressing in the proper locations according to USPS EDDM Standards. With EDDM Full Service, we take care of everything for you. Use our easy to use online tool to choose a product, upload artwork, and choose your EDDM routes. Then we take care of the printing, bundling, EDDM processing and delivery to USPS. Make sure to use our Full Service EDDM templates with our indicia information before uploading your artwork. What is Every Door Direct Mail™ (EDDM)? EDDM is a U.S. Postal Service Program developed to help businesses get their promotions or advertisements into the hands of a targeted audience, meanwhile reducing the cost of preparing and delivering your mail. It’s the perfect solution for businesses large and small, allowing you to target homes in your area or across the country. No mailing list or postage permit is required, saving you time and money. And for as low as $0.16 per piece, you’ll save a bundle over first class rates! Please note: EDDM must meet “commercial flat” specifications. Our system’s built in EDDM tool makes these specifications easy to adhere to. Who Can I Mail To? You can mail to any home or business on the routes you select using our built in EDDM tool. Simply choose a center point by providing a street address, zip code or city and the system will show you the available routes in that area. You can then choose which routes to target using our simple map overview. The built in EDDM tool allows you to see demographics of recipients in your chosen routes. You can even choose only residential addresses by selecting the “Exclude Businesses” checkbox. We offer a Print Only and a Full Service EDDM solution. Print Only: with our Print Only EDDM solution, you decide how you’d like your orders processed and we’ll determine which sizes and products will work. If you’d like to process an EDDM order on your own, visithttps://www.usps.com/business/every-door-direct-mail.htm for more information. Full Service: our Full Service EDDM solution takes the guess work out of the EDDM process. Select a product, choose your routes, then upload artwork. We’ll take care of the paperwork and delivery. How do I set up the indicia for my EDDM artwork? If you are processing your own EDDM order, make sure to download and use the proper indicia provided by USPS. Also download our Print Only Templates and follow all standard USPS EDDM requirements. For more information, please visit: https://www.usps.com/business/every-door-direct-mail.htm. If you are using our full service solution, the indicia and addressing is provided on the Template for your convenience. They must stay on the top half of the artwork and be saved with your artwork file. Remember this indicia must be present on one side of your artwork. This means if your artwork is 4/0, it must be placed on the front. 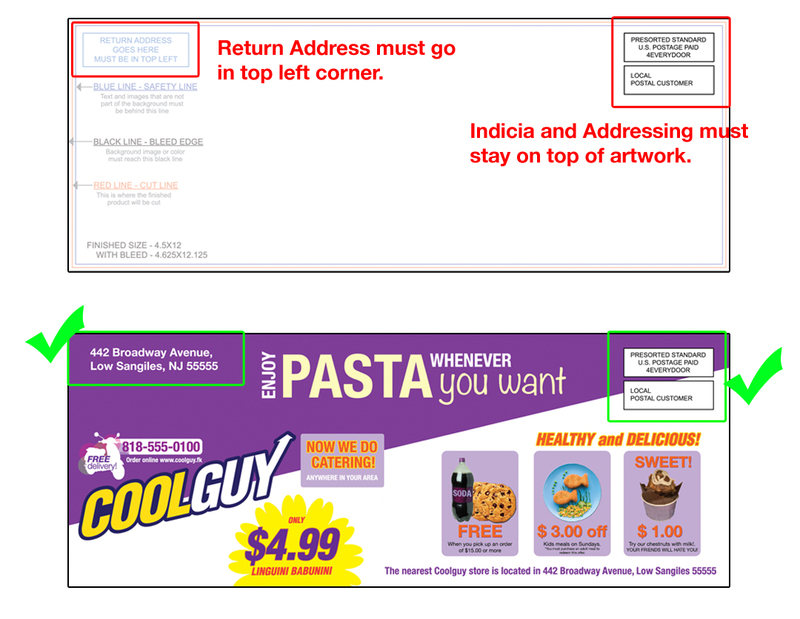 You must also add a return address to the artwork. What Types of Files Should I Upload My Pictures In? PDF files are recommended but you may also send the following file types: jpg, jpeg, tif, tiff, and eps. On the Route Selection page, how can I adjust the number of homes and/or businesses I've selected? Once you have entered a zip code or an address of the area you are interested in, then you will be able to select the different routes on the map for that area. You can click on the routes on the map or click on the list view to get a list of the routes in the area. You can select to show residential only or show all by clicking the check mark in the summary window. You can deselect a route by clicking on it again.